With built-in motion sensor and custom app Pivo smartphone camera stand lets you enjoy smart mobile photography. Like the idea? Let’s keep checking. The Pivo is an innovative and versatile phone camera stand that measures 2.9 inches tall by 2.5 inches diameter and weighs 4.9 ounces. 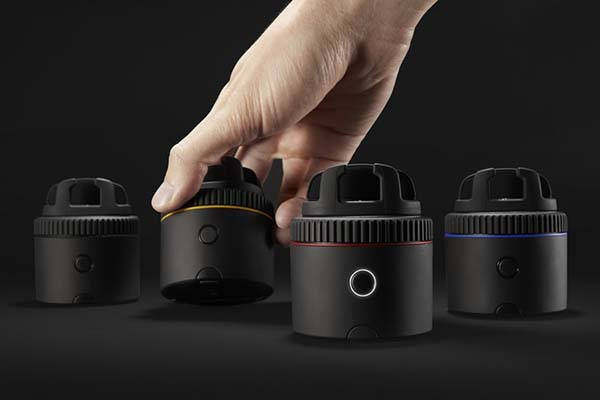 As we can see from the images, the Pivo sports a low-profile cylindrical form factor with solid black matte exterior, and the compact design allows you to effortlessly take it with you anywhere. Meanwhile, the ABS body delivers a durable construction. With a retractable tripod, the stand can stably stand on any surface, while the integrated bubble level keeps it level for perfect shoots. The Pivo smartphone camera stand comes with a 2.4GHz RF remote so that you can effortlessly control it from up to 50ft (15m) away. Furthermore, built-in Bluetooth 4.0 technology allows it to wirelessly connect with your smartphone. With its versatile companion app, the Pivo is able to bring more creative photos and videos including rap-battle-like video angle cuts, the illusion of a party-of-one or a clone army, perfect panorama, 360-degree photos and videos, motion timelapse, 50% still image and 50% animated GIFs, and more. 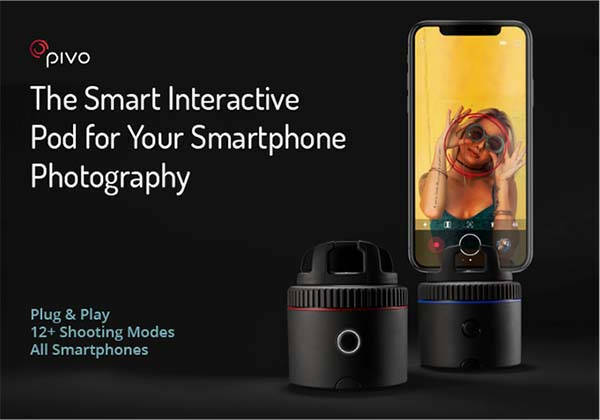 Moreover, two auto-follow modes make it a great companion for live streaming including FaceFollow auto-tracking and Object tracking, while smart capture lets you trigger Pivo to take a picture or start recording via snapping your fingers. In addition. it also supports multi-platform live streaming at the same time. Its rechargeable battery offers 10 hours of usage on a one-hour full charge. The team behind Pivo is raising fund for the product on Kickstarter. We can pledge $69 to preorder the smartphone camera stand. It will be shipped in March 2019.